Constantine IX Monomachus. 1042-1055 AD. Constantinople, c. 1042-1046 AD. AV Histamenon Nomisma, 4.44g (29mm, 6h). +Ihs XIS REX REçNANTInm Christ enthroned facing, wearing nimbus cruciger, pallium and colobium, and raising r. hand in benediction; in l. hand, book of Gospels; triple border / +CwnstAntn bASILEuRM Bust facing, bearded, wearing crown, loros and saccos, and holding cruciform sceptre and globe surmounted by patriarchal cross; triple border. 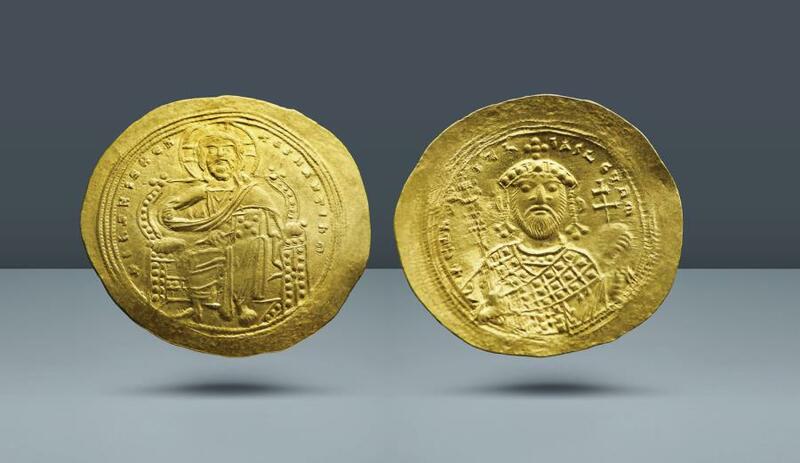 Constantine IX came from a distinguished and affluent family. He was good looking and easygoing but not much of the ruling type. He was already a middle aged man that was living in exile in Mitylene when the empress Zoe recalled him to Constantinople. The reason for this action was that she and her sister Theodora were jointly ruling together since April of 1042 since the death of Zoe’s husband Michael IV (first, the younger lover of over 40 years and then murderer of her first husband Romanus III in 1934). Zoe and Theodora despised one another to the extent that Zoe had her sister put in a convent to avoid her interference in ruling. To cement her leadership, Zoe took Constantine IX as her husband and he became ruler and she the mere wife. The reality was that Zoe was the one holding the strings and making the decisions. She died in 1050 and Constantine continued to rule until his death in 1055 at which point, Theodora re-entered and took the throne at the ripe old age of 74 years old. She died in 1056.